Quite possibly, the most recognizable voice in all of country music belongs to "The Man in Black," John R. Cash. His forays into the fields of country, folk, rock and even gospel music, distinguish Cash as one of the most intriguing performers in all of 20th century popular music. In addition to one of the most impressive musical careers of all time, he enjoyed success and garnered tremendous respect as an author, actor and Biblical scholar. Born Feb. 26, 1932, in Kingsland, Ark., J.R. Cash was one of six children belonging to Ray and Carrie Rivers Cash. When John was 3 years old, his father took advantage of a new Roosevelt farm program and moved his young family to Dyess Colony in northeast Arkansas. There the Cash family farmed 20 acres of cotton and other seasonal crops, and young John worked alongside his parents and siblings in the fields. Music was an integral part of everyday life in the Cash household. John soaked up a variety of musical influences ranging from his mother's folk songs and hymns to the work songs from the fields and nearby railroad yards. He absorbed these sounds like sponge absorbs water. In later years Cash would draw from his life in Arkansas for inspiration: "Pickin' Time," "Five Feet High and Rising" and "Look at Them Beans" are all reflections on Cash's early life. Cash remained in Dyess Colony until his graduation from high school in 1950. As a young man he set off for Detroit in search of work. He ended up in Pontiac, Mich., and took work in an automotive plant. His tenure in the North Country was short-lived and Cash soon enlisted in the U.S. Air Force. After basic training in Texas (where he met first wife Vivian Liberto), he was shipped to Landsberg, Germany. While in the service Cash organized his first band, the Landsberg Barbarians. After his discharge in 1954, Cash returned stateside and married Liberto. He and his new bride soon settled in Memphis where Cash worked a variety of jobs -- including that of appliance salesman -- while trying to break into the music business. In 1954, Cash auditioned as solo artist for Sam Phillips' Sun Records. He entertained hopes of recording gospel music for the label, but Phillips immediately nixed that idea. By the following spring, though, Cash was in the Sun Studios to record with his band The Tennessee Three. The original group consisted of guitarist Luther Perkins, bass player Marshall Grant and Red Kernodle on pedal steel. Kernodle bailed out of the session and Cash's first release for the label, "Hey Porter" had a sparse, but highly effective instrumental accompaniment. Though an impressive single, the song failed to chart. Cash's follow-up release for Sun, however, fared substantially better. "Cry, Cry, Cry" managed to crack Billboard's Top 20, peaking at No. 14. A long succession of chart singles followed. "So Doggone Lonesome" and "Folsom Prison Blues" both broke into the trade publication's Top 10. But Cash's fourth chart single proved to be his career song. "I Walk the Line" shot to Billboard's No. 1 position and remained on the record charts for an incredible 43 weeks, ultimately selling over 2 million copies. But all was not well. Cash was spinning out of control. His marriage was collapsing and divorce seemed inevitable. Too, his grueling tour schedule (which was now up to 300 shows a year) had taken its toll. Cash became dependent on narcotics to keep up the hectic pace. By the mid-1960s, Cash was a wreck and it began to impact his career. By 1967, though, Cash managed to overcome his addiction with the help of his singing partner June Carter and her family. In 1968, he and Carter were married and his career experienced a renaissance. Throughout the remainder of the decade and into the 1970s, Cash was at the top of his game. A pair of live recordings made at Folsom Prison and San Quentin both went gold and a passel of awards followed including the Country Music Association's Entertainer of the Year and Male Vocalist awards in 1969. The final payoff though, was a network television spot. 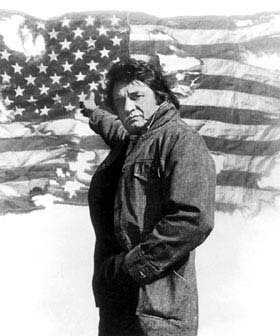 Premiering in 1969, The Johnny Cash Show aired on ABC. Taped at Nashville's Ryman Auditorium, the show featured an eclectic mix of guests ranging from Bob Dylan and Neil Young to Louis Armstrong and Merle Haggard. Through his selection of guests, Cash helped bridge the generation gap and break down musical barriers. He also used the show as a forum to discuss and raise the country's collective consciousness about social issues of the day such as the plight of the Native Americans, prison reform and the conflict in Vietnam. The show ceased production in 1971, but Cash continued to host numerous specials for several years. 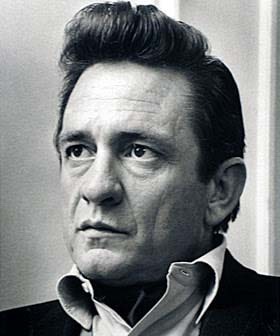 In 1980, at the age of 48, Cash became the youngest living inductee into the Country Music Hall of Fame. The Rock and Roll Hall of Fame bestowed its honor on him in 1995, thus making him one of a handful of country artists in both organizations. In 1985, Cash joined friends Willie Nelson, Waylon Jennings and Kris Kristofferson to form The Highwaymen. The supergroup released three albums between 1985 and 1995, scoring a No. 1 hit with the single "Highwayman" from their first album, The Highwaymen. Although battling serious health problems in the late 1990s, Cash entered a professional renaissance after signing with rap producer Rick Rubin's American record label. American Recordings, released in 1994, won a Grammy for best contemporary folk album. The follow-up, 1996's Unchained, earned the Grammy for best country album in 1997. His 2000 release American III: Solitary Man, included a cover of Neil Diamond's "Solitary Man," which won Cash a Grammy for best male country vocal performance in 2001. In 2002, Cash released American IV: The Man Comes Around which included the Nine Inch Nails single "Hurt." 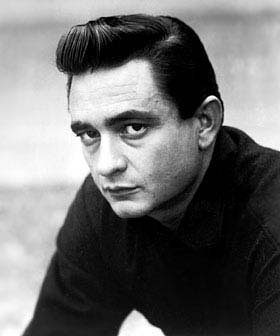 Cash earned three CMA awards in 2003, and the acclaimed video for "Hurt" won an MTV award and a Grammy. After losing his wife June Carter Cash unexpectedly in May 2003, Cash passed away Sept. 12, 2003 at Baptist Hospital in Nashville, Tenn. from complications from diabetes.